The plot of Mitridate can seem more complicated, at first glance, than it actually is. I'll try for a brief overview here; for a still shorter version, see Twitter. The scene opens, in fine classical fashion, in medias res, with the king of Pontus believed dead, and his sons hotfooting it to the capital. Farnace, the elder son, wants to make sure of his succession; Sifare, knowing his brother is sympathetic to Rome (gasp!) wants to foil his plans. Aspasia, Mitridate's betrothed, is the object of Farnace's unwelcome advances, and Sifare's ardent and reciprocated affection. When Mitridate returns, his head bloodied but unbowed, he brings with him the princess Ismene, long betrothed to Farnace, and once loved by him. More than just a pining damsel, Ismene turns out to have a robust commitment to Enlightenment ideals, but more on that anon. Farnace's ongoing conspiracies with the Roman tribune Marzio are discovered by Mitridate, along with his cruelty to Ismene; exposed, Farnace denounces Sifare's love for Aspasia to their father. The lovers unavailingly protest their allegiance to duty, and proceed to suicidally despair in music of great beauty. The monarch's fulminating rage is reproached by Ismene, but more pertinently interrupted by the advent of the Roman armies. Ismene rescues Sifare from prison; Sifare prevents Aspasia from drinking the poison which Mitridate has sent her; Farnace repents of his alliance with the Romans; they all convene on the battlefield, where Mitridate is dying, noble as, or nobler than, he lived. The king professes for the final time his loyalty to his own true nature, and is reconciled with his sons, and they with each other. The opera concludes with a defiance of Roman tyranny. It is not the least of my praises for the performers of the Little Opera Theatre that the political and emotional narratives developed clearly in their hands. The staging did much with little; the projections designed by Alex Koch established the context of the narrative concisely, and I thought having eighteenth-century depictions of classical ruins for the various locales was a very nice touch. Philip Shneidman's direction had the performers using the space creatively (this means that the best views may be further back than my second-row seat.) There's so much going on that having the emotional relationships of the characters clearly established and developed seems no bad directorial priority to me. Having the Romans as punk neo-fascists worked surprisingly well. The costumes generally placed the action in a stylized, pseudo-classical setting; I was expecting more to be done with the politically powerless position of the strong-willed women of the piece than I saw, in the end. The fraught father-son relationships of the piece were not complicated further by the production, aside from a brief, tantalizing moment when Sifare makes the motion of stabbing his father's empty throne before hastening off to aid him in battle. As I said earlier, there's much to ponder. Among other things I pondered last night was this question: was Mozart as cruel to tenors as Richard Strauss? 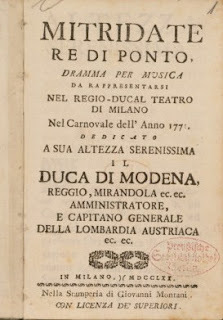 The original vocal parting had castrati in all the male roles except those of the rival rulers, Mitridate and the tribune Marzio. Blake Friedman made a sleazy, boo-hissable Roman, and impressed me with the strength and agility of his bright voice. He sang the murderous "Se di regnar sei vago" with great panache... and a crack, but I would still call his performance quite creditable. Andrew Drost attacked the central role of Mitridate valiantly, and was admirably committed to portraying the monarch as essentially noble and emotionally conflicted. Countertenor Eric S. Brenner made a sympathetic Arbate (the governor, who is more important than my synopsis makes him; sorry.) Cláudia Azevedo was an elegant and touching Ismene, with whose shaping of vocal line I was impressed. re the Strauss question, yes, though Strauss likes to get them with the awkwardly high tessitura, whereas Mozart just likes to throw notes at them. There is probably some arcane calculus thing that would help us quantify this by average number of notes missed per performance of "Fuor del mar" or "Se all'impero". Would you believe I've never heard it? I'll see if I can find that Ponnelle film.